It is by a good distance the best selling strimmers in the UK market. The affordable price of around £25, coupled with a 4.2 out of 5 star rating, has made this the most popular choice of all the available corded strimmers. It also has the really solid and reliable Bosch brand behind it. This one is ideal for those with small gardens, as it is lightweight and easy to use. Compared to many other models, this one only weighs 1.7 Kg, and helps avoid arm fatigue. This is of course a corded product. You plug it into the mains and you are good to go. That of course avoids the worries of having to charge a battery, or worry about trying to start up a petrol strimmer. That also makes it relatively environmentally friendly. The trimmer is driven by a powerful 280 watt motor, and that can deliver up to a huge cutting speed of 12,500 rpm. That is impressive by any standards.​ So we know that powering it up is easy, and we know that it delivers fast cutting to the main cutting head. This is the problem with most grass trimmers, keeping a constant feed. There is a balance to be had between having a good length of feed, and also not using the feed or line up to quickly. That can be a hard balance. With automatic feed strimmers the line is fed out each time it is powered on. It is the best seller in the UK market. This strimmer has been bought by thousands of home owners, and has maintained a consistently steady rating. 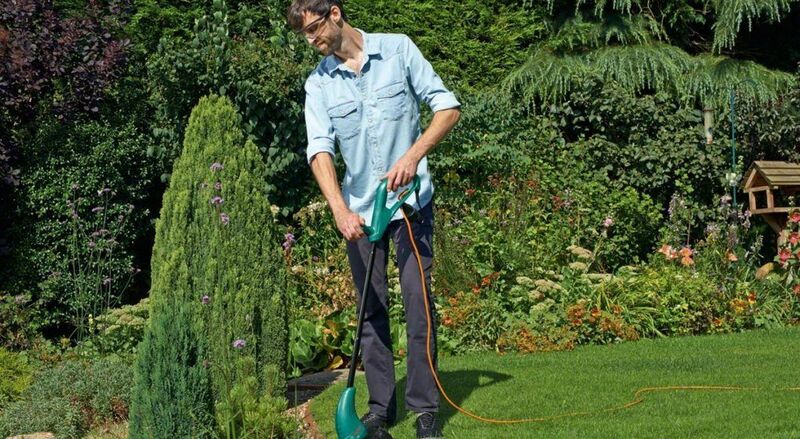 If you have a small garden or simply use a strimmer for a bit of general tidy up, then this one will do the job nicely. If these are not the right corded clippers for you, then click here to see our top rated list. Overall though it is clear that generally speaking buyers like the ​Bosch ART 23 SL Electric Grass Trimmer. It is a huge seller, and that would simply not be the case, if this machine was poor quality. It can tackle light grass, lawn edges, and also get stuck into the thick or long stuff if needs be. Buyers say that the tool is easy to operate. It is certainly lightweight and has a nice balanced weight distribution when in use. That makes it comfortable and also easy to manoeuvre, Overall we think it is an ideal lawn care tool.